The financial markets according to musical group Pink Floyd: “Hello, is there anybody in there? …Is there anyone home?” As trading volume recedes and the daily moves become relatively microscopic, investors are trying to figure out the next “big” move. Whether QE is the smoke on the horizon or Europe’s pain is eased, the markets can’t hear what is being said. So let’s remove the clouded veil and take a look at the markets, asset classes and industry groups to help determine whether we should stay comfortably numb. One of the more popular and recurring themes since the beginning of the QE programs has been to invest in gold, expecting that inflation or drastically falling dollar would push the precious metal to incredible heights. So far, the investment community is still waiting. In fact, from the market bottom through yesterday’s close, the GLD ETF has underperformed the SP500. That could change based solely upon the metal’s penchant for long quiet periods punctuated by ripping rallies (see here). What is interesting is that we may be in the very early stages of a market rotation toward the industrial and basic materials, and away from the safety of utilities and consumer staples. 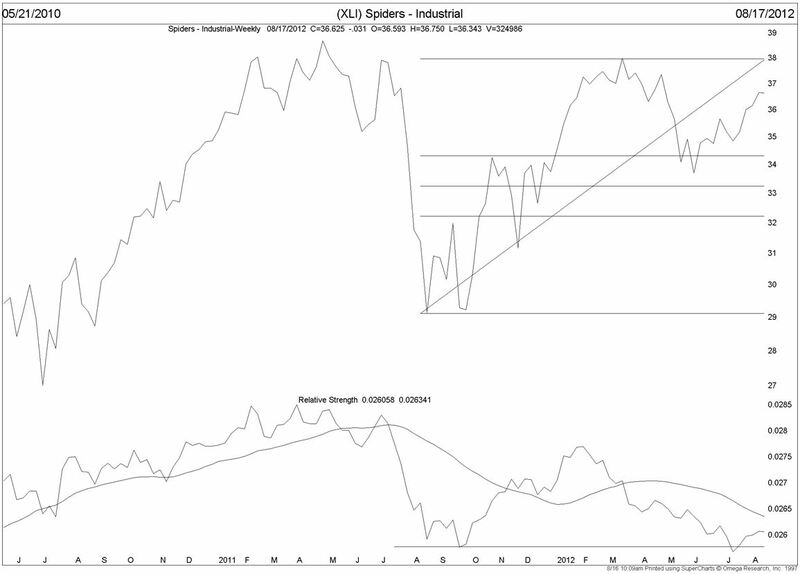 The busy chart above is that of the Spider ETF for the industrial sector (ticker XLI). Let’s go through a few of the technical highlights that could point to resurgence in this sector. First is the price action itself. After falling with the downgrade of US debt last summer, the industrial sector fell hard and bounced, falling again after the economy failed to pick up after the first quarter of this year. The spring retracement was roughly a 50% pull-back from the April ’11 peak. Making money is a wonderful thing, but investors are interested in beating the market. The graph at the bottom shows the relationship between the industrial group and the SP500. Similar to the price action, relative performance declined rapidly last summer only to bounce a bit and fall back. Unlike the price chart, relative to the SP500, industrials are in the same place they were at the price bottom last September. Not shown in the chart is the valuation of many industrials. Take Caterpillar (one of our favorites and we currently hold) as an example. If we go back to 2000, the yearly low price of CAT has averaged 14x prior years’ earnings, even including the 2008-2010 period. Excluding those years, the average remains at 14x. CAT is on track to earn $9.75-10 per share this year and if the relationship holds, the stock is worth at least $135-140 next year, a gain of 50% from current levels. CAT also pays just over 2% dividend and has more than doubled their dividend in the last seven years. Looking at the flip-side of the industrial stocks, the utilities paint a different picture. 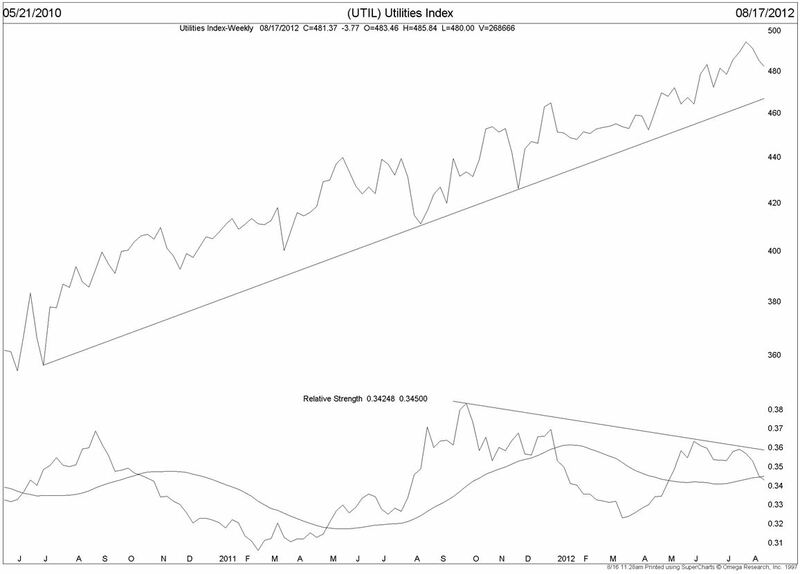 Here the utility index has steadily increased in price for the past two years. Relative to the SP500, the graph at the bottom of the chart, the utility sector has struggled to keep up with the index since the market bottomed last fall. In an effort to find alternatives to very low treasury yields, investors have flocked to utility shares – effectively pushing valuations and historical yields to extremely low levels. Here, valuations are stretched, with many utility shares trading at 18x or more for current year earnings and earnings growth of 2% or so annually. Dividend yields that are relatively small compared to historical ranges. The shift from “risk off” to “risk on” groups makes some assumptions many are not willing to make: Europe doesn’t implode, the US doesn’t fall off the fiscal cliff or economic growth around the world accelerates. A better way to look at the potential for this shift is to think of the relationship between the utilities and industrials as a rubber band that has stretched very far in one direction that will, over time, return to more normal levels. The expectation is that utilities underperform industrial stocks over the coming 6-12 months. Is today THE day to sell utilities and buy industrials? It may not be, but the relationship is telling investors that returns on utilities are likely to be well below historical norms and returns on industrials are likely to be above historical norms.